The redesigned PowerBomb is a four-stroke header that incorporates FMFs patented PowerBomb module at a precise location in the initial stage of the header. By positioning this Bomb at a key point in the system, increased performance and flow is achieved through the expansion and contraction of exhaust sonics through the system. Result is a flow increase of nearly 10%! The outer chamber in the Powerbomb allows the air to expand, cool and ramp back up at a higher velocity. Additionally, the PowerBomb is a pre-muffler of sorts which helps to lower the bikes sound output by providing more sound absorbing surface area for the sound medium (exhaust gases). Designed for use with FMF mufflers and not guaranteed to fit other brands of mufflers. If you have a po box, please provide BOTH the po box and physical street address. Some items may have a slightly different appearance than what is shown in the picture. Please review the entire description to verify proper fitment. We can not mark items as "gifts" or change the value. 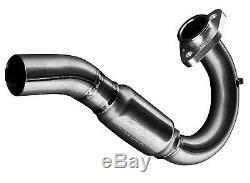 The item "FMF Powerbomb Head Pipe Kawasaki 2009-2016 KX250F Stainless Exhaust Header" is in sale since Wednesday, July 16, 2014. This item is in the category "eBay Motors\Parts & Accessories\Motorcycle Parts\Exhausts & Exhaust Systems\Other Exhaust Parts".